7/10/10 - UPDATE: Sadly Indietracks didn't reach the shortlists for the UK Festival Awards, but a big "thank" you anyway to everyone who voted! Thanks once again for your amazing generosity in donating to our appeal for the Midland Railway centre. If you haven't seen it already, you raised nearly £2,000 which will help the charity finish the station building at Swanwick. We're just posting to ask you for another favour, which doesn't involve donations this time, but instead just a minute of your internet time. Indietracks has once again been nominated in the UK Festival awards, and it would be fantastic if you would like to vote for the festival again this year. To vote, you just need to visit http://www.festivalawards.com/, fill in the quick sign-up form and tick the boxes. It literally just takes two minutes and is dead easy. Voting stays open until 6 October. 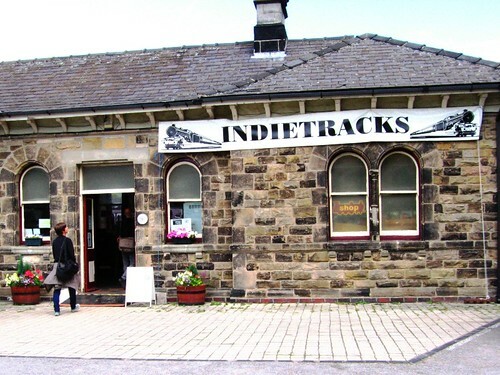 Thanks to everyone's votes, Indietracks has been shortlisted as best small festival for the last two years. La Casa Azul even won an award last year for their Indietracks 2009 headline slot, seeing off competition from the likes of The Prodigy, ZZ Top and The Specials. We think getting nominated or winning can help the festival in a few ways: it's a cost-free way to help new people find out about the festival; and it's a useful thing for us to be able to say to potential bands, the local council, the Midland Railway trustees etc. to help show that the festival is a good thing.